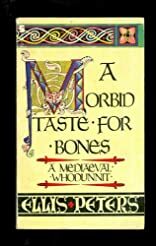 A morbid taste for bones. About Ellis Peters (Author) : Ellis Peters is a published author. Published credits of Ellis Peters include Never Pick Up Hitch-hikers!.